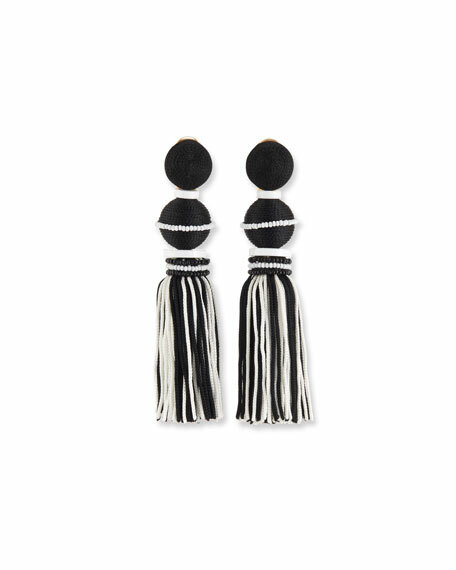 Oscar de la Renta two-toned tassel drop earrings. Polished yellow golden hardware and clip backs. Two thread-wrapped balls with tassel drop. Two-toned Swarovski crystal glass beads. Oscar de la Renta crystal dandelion earrings. Polished pewter hardware and settings. Clear crystal posts and accents. Post backs for pierced ears. Approx. 1"L; 1"W. Made in USA. Oscar de la Renta impatiens-inspired drop earrings. Beaded oval top and tassel drops. Layered petals create 3D floral silhouette. Approx. Oscar de la Renta impatiens-inspired drop earrings. Polished yellow golden metal hardware. Layered petals create 3D floral silhouette. Beaded oval top and tassel drops. Clip-on backs. Painted flower earrings by Oscar de la Renta. Polished yellow golden brass hardware. Resin-painted four-petal flower studs. Approx. 2" diameter. Painted flower earrings by Oscar de la Renta. Polished yellow golden brass hardware. Resin-painted four-petal flower studs. Approx. 2" diameter. Clip-on backs. Imported.